The year 1977 is not generally lauded as a watershed year for anything. Generally, bluntly, it was a crap year, a nothing, the false star-spangled energy of the Bicentennial gone, nothing in its wake but more of the encroaching late-’70s darkness. Families crumbled as divorce rates rose. A flagging economy tried to prop itself up on fads and cheap plastic drek while a nation reeled from the aftershock of a tragic and cripplingly ill-advised war in Vietnam. In 1977 it had only been a few years since the President himself was forced from office for willfully and criminally subverting the entire democratic process. But 1977 was a good year for me. First of all, my brother and I played on the same little league team for our second and final year, and my brother was the star of the team, one of the three best players in the league, and I wasn’t too bad, either. All was good in the world. When little league season ended, the summer continued to bring joy. During that summer my brother and I saw what we immediately realized was the best movie of all time, Star Wars, and then we saw Star Wars again, and then again. And that wasn’t the only thrill at the movies in 1977. We experienced, finally, during our yearly visit to see our dad in New York City, the wonder of Sensurround (a midtown double-feature of Rollercoaster and Midway), and just before that double feature we spent a couple thrilling days in a totally darkened city, and though my father probably worried about all the looting and lawlessness of the citywide blackout that summer, it seemed to my brother and me as if we were living inside a movie, a real life disaster: Blackout ’77! (in Sensurround). And if all that weren’t enough, 1977 was also the year I saw The Bad News Bears in Breaking Training and cheered out loud with a theater packed with boys like me. I fully believed, more than ever before, more than ever after. I was nine years old. It was my best ever year. Presiding over the happiness of 1977 were the Red Sox, my favorite team, who thrilled nine-year-olds and nine-year-olds at heart all over New England by smashing a team record number of home runs while contending for a division crown. PIRATES: Pat Lackey of Where Have You Gone, Andy Van Slyke? I also considered using Skip Dillard in a platoon with Denny Doyle, since Doyle had considerable trouble hitting lefties that year, while Dillard hit them decently. 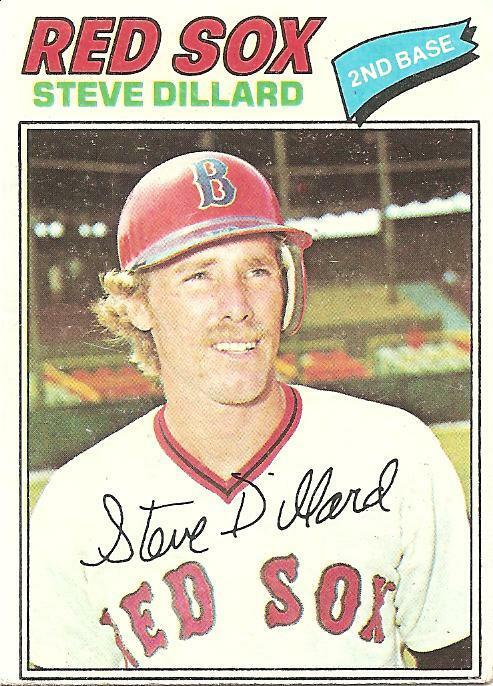 But when I discovered that (contrary to the text on the back of his 1977 card, which claims in customary back-of-the-card cavemanese that “Steve is outstanding glove man”) Dillard was rated by Strat-O-Matic as an atrocious 4e30 at second base (the game’s equivalent, roughly, of a statue that, defying the laws of matter, also somehow suffers from poorly timed epileptic seizures). So Doyle got the nod against lefties as well as righties, and go figure, after the Red Sox lost their opener they got on the board with a win in game 2 on the strength of Denny Doyle ripping two crucial doubles off a lefty, Mike Flanagan. I guess there’s no end to the wonders of 1977. You are currently browsing the archives for the Steve Dillard category.